We got a bit of good news over the weekend and to celebrate I asked the Husband what sweet treat he’d like me to whip up for him. I gave him a few options and he settled on a crumble tart. Not sure why I was so against the combination – they’re both tart fruit, they both go well in crumbles. I’m just someone who gets annoyed when I can’t get my hands on the things I want / plan for and I can sometimes have a short temper. Sorry. As it happens, I don’t know why I was being so fussy! 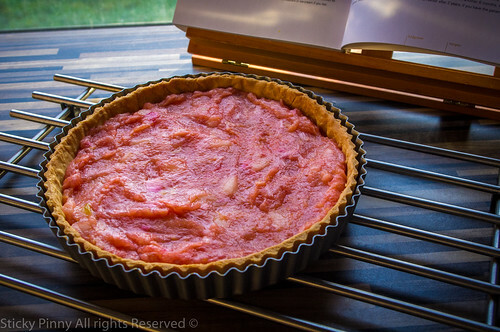 The tart worked out wonderfully and here I am eating my words. Crisp, short, crumbly pastry encasing a sweet, yet tart, fruity compote and then topped with a hazelnut brown sugar crumble. Delicious – this is a nice modern take on a standard crumble, which you should try. 1 x qty of sweet shortcrust pastry – I make my own, my preferred recipe is Dan Lepard’s or just use shop bought if you don’t want to. Heat the oven to 190C. Roll out the pastry thinly, but still robust enough to handle, to fit a 24cm tart tin (or individual tins). Trim the edges of the pastry. Prick all over with a fork, chill in the freezer for about 30 mins. This will help with any possible shrinkage. Line the pastry with baking paper or foil and baking beans, making sure the walls of the pastry are well supported and bake blind for 20 minutes. Remove the beans and paper, and cook for 10‑12 minutes more, until lightly browned. Add all of the compote ingredients into a pan and leave on a low heat until the fruits are soft and the sugar has dissolved – you want it to be a soft compote. Sieve this mixture to drain off any excess fluid (you don’t want any soggy bottoms!) but reserve the liquid as this can be used as a bit of a sauce for serving later on. Spread the mixture over the blind baked pastry base. For the crumble, sift the flour into a bowl and rub in the butter until the mixture resembles breadcrumbs. 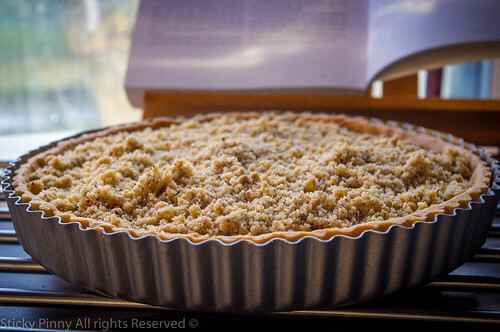 (Or use a food processor like I did) Add the sugar and ground nuts, add a drop or two of cold water so the crumbs gather into some smallish lumps and scatter over the tart to give it a rough topping. Bake for 30 minutes until golden brown. Serve warm or cold with cream, ice or double, lots of. Oh, and some of the reserved fruity syrupy juices!